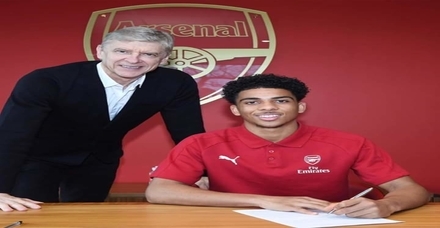 Nigerian born talented winger, Xavier Casmier Amaechi signed his first professional contract with Arsenal Football Club. Xavier, who turned 17 today, joined the North London club in August 2013 and has featured for both Arsenal U-18 team, as well as, the Arsenal Youth team. Xavier is a striker and plays at the right wing position. He also render his services well at the left wing forward position. He has dual nationality, that is, he is a national of both Nigeria and England.